The labour between Finnish handset vendor Nokia and software giant Microsoft has borne its first fruit – an Office productivity suite for Symbian devices. Microsoft Communicator Mobile is a unified communications client designed for the Symbian-based Nokia Eseries smartphones and allows enterprise users to see their colleagues’ availability, and click to communicate with them using the best method, from IM to email, text to phone call. The names and status of colleagues are embedded directly into the devices’ contacts application, enabling users to update their own presence, start and join instant messaging sessions, and begin calls directly from the contact card. 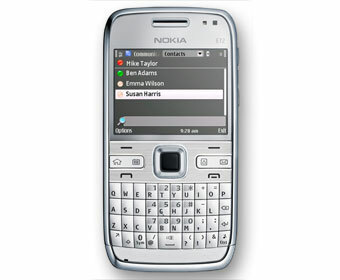 The launch is the first product from an alliance announced in August 2009, which sees the two companies collaborate on the design, development and marketing of mobile enterprise platforms including Microsoft Office Mobile and other business communications, collaboration and device management software for Symbian devices. The first product is available for English speaking users from Nokia’s Ovi Store, from this week and will be initially available for the E72 and E52. Nokia plans to deliver Communicator Mobile pre-installed on select Nokia smartphones in the future and plans to support additional devices, including the recently announced Nokia E5. The news has reignited old rumours that Nokia is working on a Windows-based mobile handset, rumours that were well fuelled by the original partnership between Nokia and Microsoft last year. However, the speculation may not be without foundation. The Finnish handset vendor did after all choose Windows 7 as the operating system for its Booklet 3G netbook device launched late in 2009.